though I do realise we are as nothing compared with Northumberland, but we were still excited, in an odd sort of way, to see frost pictures on the inside of the landing window. At least our nice thick curtains, which I made in the early 1980s, and are now on their I think fifth set of windows, are doing their job. The cold also means we have masses of fieldfares and redwings in the garden, plundering the yew berries AT LAST - am hugely relieved to see this, as the sooner they're gone, the sooner I will be able to stop supervising the dog every time she goes out into the garden, as she is partial to yew berries. Although the berries themselves aren't poisonous, the tree always seems to shed its leaves at the same time, and they simply go down the same way, as far as the dog's concerned. After a mercy dash to the vets for a stomach wash out when we first got her, we've been a tad wary ever since. 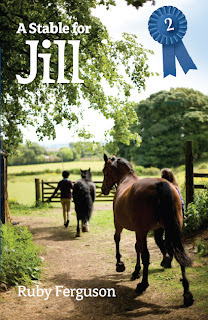 Many thanks to Vanessa of Fidra for sending me this utterly gorgeous new copy of A Stable for Jill. I love the look of this one. I liked their edition of Jill's Gymkhana, and if anything, like this one even more. Fidra have done really well with their cover pictures. Better still, of course, is the fact that this edition includes the full original text (though to be fair, there weren't huge cuts in the Knight paperback) AND the Caney illustrations, and they were cut from the Knight paperbacks, to be replaced by Bonar Dunlop's piebald Black Boy. The book isn't yet available from the usual suspects, but it is available from Fidra's website, and should be available very soon if you want to order it from Book Depository etc. I've never been more grateful that we have a labrador who though lacking in some respects, and who is full of low criminal cunning, was at the front of the queue when God handed out labrador brains. Thanks to Susanna, who saw this first. 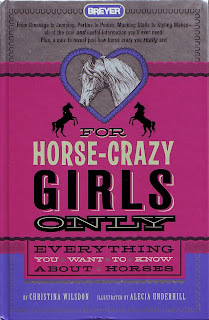 Ponybookchronicles on Saki: who, as she says, doesn't really do horses, though plenty of other animals. Christina Wilsdon encounters the fantastic side of life out on a walk. I love this picture of bloodhounds at work. Who knows when this might come in useful? Thanks to Miriam Bibby, who posted this first! packing up a parcel of 15 books with great thoroughness and a lot of parcel tape, only to discover one you have missed. Fidra are republishing A Stable for Jill, by Ruby Ferguson. Their version is the first to have the full original text and illustrations since the 1960s, and it follows their very successful printing of Jill's Gymkhana. Stable will be out later this month, £7.99. Hazel Peel has written Words and Wanderings: an Author's Adventures at Home and Abroad, written under the name Wallis Peel, and published by Woodfield Publishing Ltd at £9.95. If you want to find out what makes Hazel tick, here's your chance. which is now my work in progress bookshelf, for review copies, stuff waiting to go on the website and stuff I am plundering for the blog. A bit late, but here is a quick gallop round the family holiday. We went to Northumberland. I normally like to go where there is plenty of up - Scotland and Northumberland are ideal. Other Southern parts I will not mention are not bleak enough. I am lucky enough to have a family who humour me in this, and who like up too. For some reason I can't fathom, I had a yen to walk along beaches, and so, because I have a family who humour me, and we traded off a trip to Edinburgh with the teenage members of the party, along beaches we walked. Bamburgh, despite the idyllic looking scene below, was blowing a gale. It was the dog's first experience of a beach walk, and she was deeply unimpressed. Her ears were pinned against her head by the icy blasts, and she walked behind us the whole way, her human (and unfortunately inadequate) windbreak. When is a horse not a horse? A study in 2004 analysed the remains of five horses found in the house of the Casti Amanti in Pompeii, all of which were well preserved by the volcanic ash produced in the erruption of AD 79. Analysis of the DNA showed four normal horses, and a highly unusual DNA in the fifth the researchers believed was of a breed of horse now extinct. Susan Gurney, of the University of Cambridge, has revisited the original research. The fifth sample with the supposedly extinct DNA, contained, due to a laboratory error, the DNA of two animals: a donkey and a Herculaneum horse. In a slight alleviation of the orginal researchers' blushes, the donkey's DNA shows it is from the Somali strain, rather than the Nubian strain more common in Europe, showing that the Somali strain was present in Italy from at least Roman times. Many thanks to Jonathan Badger for sending me this. If your horse didn't come fully equipped with facial markings, this was not a problem for the 17th century horse (or at least, for the horse's owners. Most of these methods were a problem for the horse). A whole sheaf of recipes existed, the object of which was to provide a permanent star, not just a temporary bleach job. Gervase Markham, in his Markham's Masterpiece, Containing all Knowledge Known to the Smith, (1615)gives several recipes you could visit upon your unfortunate horse if you wanted to create white hair: whether on the forehead or anywhere else. Answering every purpose where Physic is required [to be sold] by the Maker, E J Palfrey, Farrier, at the Horse Infirmary, Coventry, where DISEASES and ACCIDENTS incident to HORSES are judicious treated; Horses and Colts cut, Tails set, Ears Foxed or Cropped, Stars in the forehead made in the best and modern Manner &c &c.
The really terrifying thing about this advertisement (for which, to Rosemary Hall, many thanks) is that the Coventry Horse Infirmary might have been the best thing available.